The Unknown, Entertaining Mind of Miss Dena Jones: Me Miss Friend ! and blog candy update! Hello, friends ! I'm still working on sending out emails to the winners in my blog candy extravaganza blog hop last weekend. I've already notified a few and got responses back from them. There are still a bunch of emails to go out and, as promised, everyone will be notified no later than this Sunday. So, sit tight. You may be getting an email from me in the next few days! Today's project is a card featuring a digi from an awesome new company called eyeCandie Creations. They were so kind to participate in my blog hop as one of my sponsors. They've been so wonderful to work with! If you're not familiar with them, please check out their shop. They just released a bunch of new images to add to their kawaii-style line, and I must say, that they are too cute! Oh, and I'm not just saying that. I put my money where my mouth is! In fact, I purchased SEVEN digi's the other night! LOL! Today's project is one of those cards that turned out so differently from what I initially envisioned. But, it's okay because I do like how it turned out! =) This card features Cookie Monster Ryan. I have a toddler, so anything to do with Sesame Street tends to catch my eye. He was colored with Copics. I knew I wanted to go with a sort of "milk and cookies" theme. So, I printed some digi paper with milk cartons on it. If you'd like the source, I can look it up. Unfortunately, I don't have it handy at the moment. For the sentiment, I wanted to go with something Cookie Monster-esque. LOL I also wanted to go with a friendship theme, so I settled on "Me Miss Friend!". I used Stampin' Up! punches for the sentiment -- which I was excited about because I have been wanting to buy these punches for a LONG time! I finally got the set thanks to my friend, Cely. so cute--heading over to check out the digi stamps! what a super cute card and image! Love that card! Too cute! Oh, how adorable! Love it! Haha! That is just to cute! Oh my goodness....this is incredibly cute! 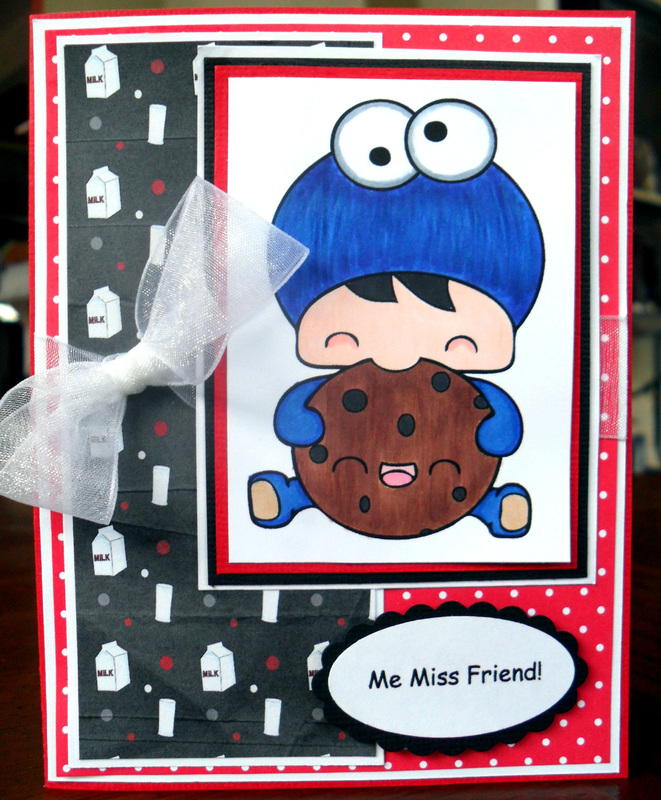 LOVE that little Cookie Monster suit and now I'm going to need to check out that digi stamp site! I got my blog hop winner notificationa and emailed you back! For some reason, my emails are sometimes going to people's spam files so wanted to let you know. Thanks SO much for the blog hop giveaway....so excited to have won a prize! Not sure if my previous post went through or not so reposting. LOVE this super adorable card! That Cookie Monster suit on the little kid is way beyond cute. I'm going to have to check out the digi site now to see if they have an Elmo (my grand-daughter's favorite). I emailed you about my blog hop prize and wanted to make sure you got it because some of my emails have been going to SPAM. Thanks again for the wonderful blog hop!